Cas Holman spent the last 12 years immersed in play, early education, and designing for children’s imagination. She talks about the commitment to this work, its impact on playgrounds, and why play is at the heart of our becoming. Cas Holman has spent the last 12 years immersed in play, early education, and designing for children’s imagination. 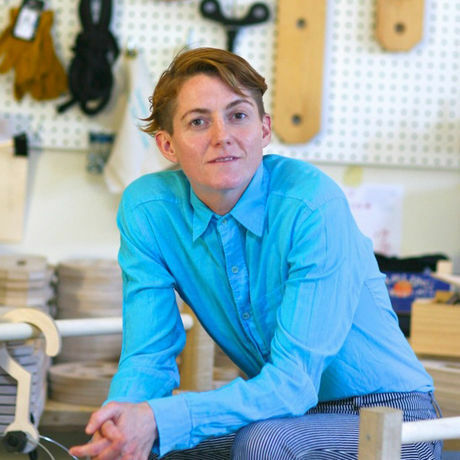 Through her company Heroes Will Rise, she designs and manufactures tools that allow children to transcend existing models of identity and the performance of play. These materials, including Rigamajig and Imagination Playground/Big Blue Blocks, are used in thousands of schools world wide, and inspire constructive play, imaginative forms, and cooperative interactions between people. Celebratory in their lack of adherence to traditional archetypes, these abstract yet endlessly interdependent pieces encourage children and adults to imagine the origin and story of the toy as well as how to use it. “What is it?” and “What does it do?” are answered via intuitive and individualized pathways such as physical details, play inquiries, and semiotic clues, making the instructions implicit in the tool/toy and the development of the design an essential element of the play experience. She is an Associate Professor of Industrial Design at Rhode Island School of Design (RISD) and prototypes her playthings on her five-acre retired summer camp known as Camp Fun. Cas travels the globe to collaborate with thought and industry leaders in early education, curriculum design, public space, and childhood advocacy. Her inspiring brave collaborators and clients include Cheng Xueqin, founder of Anji Play (Anji, China), Friends of the High Line (NYC), the 14th St Y Preschool and Jewish Community Center (NYC), and Lego Education (DK).